Blueberry Wheat Ale was the second kit I have purchased in recent months at Beer & Wine Hobby. My girlfriend had wanted to brew a fruit beer for a long time, I didn't have any brilliant ideas about how I wanted to make a fruit beer, so I purchased the kit. That we were able to brew the beer together like when we first started brewing was a nice touch as well. Recently at Fenway Park I had Wachusett Blueberry for the first time in a long time. It was an opportunity to compare and contrast a prominent, local blueberry beer with the homebrew kit. The beer pours a gold color with a pinkish hue from the blueberry. The white head is thick and frothy. The beer needs to be poured in a tall wheat beer glass which can accommodate the large head, or poured slowly in a standard Pilsner glass. The beer is clearer than most wheat beers, likely down to the 1272 American Ale II yeast clearing better than Chico or 1010 American Wheat. There is plenty of blueberry in the aroma, but also welcome wheat bread notes, berry esters from the yeast, and citrus hop aroma. The flavor is similar in that the blueberry flavor is just one component of the flavor along with the malt, hops, and yeast. 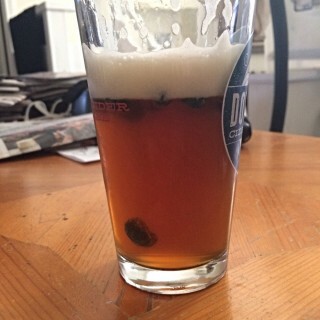 This is a beer with blueberry, not fruit juice that happens to have beer in it. The carbonation level is high. The body is medium to medium-low. I'd describe the mouthfeel as spritzy and effervescent. The finish is quite dry and closer to astringent than I would like. I may have added about 25% too much dextrose which ended up being almost 7% of the total fermentable sugars. It's not a major flaw, but a flaw I'd address if I brewed this again. The beer tastes a lot like Wachusett Blueberry. The Wachusett is a bit smoother and doesn't finish quite as dry. I suspect if I followed the kit instructions to a T, I would have had a clone. The Cascade hops from the kit differ from the Perle, Tettnang, and Liberty hops Wachusett lists online, but neither beer has a significant hop flavor. The homebrew is predictably darker because most of the grist was liquid malt extract. In the end I ended up with a brew that has about 0.5% more alcohol by volume, that is a little drier, and maybe even a little fruitier than Wachusett due to the yeast selection. The differences are very subtle. I am two for two with kits from Beer & Wine Hobby after this and the Welkin Ringer ESB. I wouldn't hesitate to brew any of their kits in the future. The Blueberry Wheat Ale is a perfect summer beer. Garnishing with some fresh blueberry makes the experience that much better. For the first time in seven years, the Beer Judge Certification Program (BJCP) have updated their style guidelines and released the 2015 Style Guidelines. A lot has changed in the craft beer and homebrewing scene since the 2008 Style Guidelines were released. A lot of the changes in the new guidelines were long overdue. In the old guidelines, the only IPA styles were American, British, and Imperial. If I were to enter WAR IPA or Camp Randall Red IPA in a competition under the current guidelines I would have to enter them in Category 23A Specialty Beer. That is essentially a catch-all category for a beer that doesn't fit in any other style. When a brewer enters a beer in Category 23A, he/she only has a sentence or two to describe the beer and how it is supposed to taste. On the closed BJCP Facebook group there has been some discord about adding all of the IPA sub-genres. Now a brewer who enters an IPA declares the type of IPA (American, black, brown, Belgian, etc.) and strenth (session, standard, or double). WAR IPA would be a standard white IPA, and Camp Randall red a standard red IPA. As a brewer and judge with a few competitions under my belt, I appreciate the additional guidance the new guidelines provide. Several new and more obscure styles have been added. For example, there is an entire Czech Lager category that did not exist before save for Bohemian Pilsner. I don't think there will be a deluge of people brewing these beers, but I think this accomplishes two things: the guidelines are used internationally so maybe brewers in different countries will want to brew them, it provides guidance to brewers and judges should those beer be brewed. My only concern with all the new categories is how would-be judges could learn all the categories and pass the written and tasting test. My hope is that the exams would focus the content on the more common styles as opposed to the newer and more obscure styles. I took my tasting exam November 22nd of last year and am still waiting to receive my score. I am terrified that I will finish below a 70 and have to start from scratch learning the new guidelines. If I don't pass I only have two years to pass the tasting exam before I have to take the written exam again. Six months is already down the drain waiting for my results. I didn't study as long and hard as most people who take the exam. I met several would-be judges who have been having weekly tasting sessions where they all sample and judge a different beer in preparation for the exam. I saw there were seats available for an exam in Portland and crammed for a few weeks. I keep checking the BJCP website hoping my results will post. If I don't pass I will have to think long and hard if I want to take the tasting exam again. There is only one exam scheduled in New England for the rest of the year. If I don't pass the tasting exam I will still have the rank of "Apprentice". In all I like the changes that have been made. Some judges think it is too much change and that too many styles were added. Whenever there is a radical change like this some people will be resistant. Going forward the BJCP has indicated they will update the guidelines more frequently with minor changes. I think that would be best for everyone. As the blog closes in on its one year anniversary, this is a first. This is the first beer I brewed for the site that I am rebrewing. As my flagship beer, I need to have some Curly's Milk Stout on hand at all times. My original brew day was last November and I am down to my last dozen or so bottles. The nice thing about a balanced stout as opposed to an IPA or hoppy pale ale is that the beer keeps relatively well as hop aroma and hop flavor are the first things to go in a beer. If you buy a six month old bottle of Peeper at a bottle shop, then find Peeper served fresh on draught, it is a completely different experience. Curly's Milk Stout works because all the ingredients contribute to the overall flavor. It's a stout so there is plenty of malt flavor, but the variety of malts contribute more than just a one-dimensional "roasted" character. The hop flavor from the Northern Brewer and Fuggles were evident without being overpowering. The unique esters from the Burton Ale yeast enhance the sweetness from the lactose. The only quibble I had with my last batch was that the initial tan, frothy head would disappear in short order. Household dish-soaps designed to rinse off easily can have a similar effect on beer foam. If there was any soapy residue on my kettle, fermenter, or bottles that could be a cause. In recent batches I have made extra precaution to thoroughly rinse my cleaned bottles before sanitizing. For this batch I substituted a half pound of my base American 2-row barley for unmalted flaked barley to see if that makes a difference in the head retention. Brew day was fairly smooth. The last batch was before I had my new 8 gallon kettle. Since I am able to boil a greater percentage of the wort, I had to adjust the bittering hops to make sure the beer has the same bitterness as the last batch. The only other hiccup was that I was short one pound of dry extract, so I had to substitute one pound of pilsen dry extract. At such a small percentage in such a dark beer, I doubt the difference will be noticeable. Splitting batches is a great way to create more than one beer at a time. My plan is to brew a five gallon batch and split off one gallon each to blend with chocolate and coffee. I am still working on the details of what coffee and chocolate I'll use and how I'll blend them. The end result will be three gallons of regular milk stout, one gallon of coffee milk stout, and one gallon of chocolate milk stout. Walk-off White was the first of two Belgian-inspired wheat beers that I brewed a few months back. It was also a re-brew of one of my earliest batches. The beer pours a cloudy pale-straw color. The head is thick, frothy and persistent. The beer is gorgeous when poured in a tall wheat beer glass that can accommodate the beer's large head of foam. The aroma of the beer is a medley of freshly-cut hay, flowers, and citrus. The honey I used in the beer was an afterthought. The recipe only called for eight ounces, and I was primarily concerned with increasing the alcohol level. I just grabbed whatever honey was in the counter. The honey turned out to be a blend of orange blossom, clover, and buckwheat honeys. The blend worked perfectly in a beer that already had fresh citrus zest. I'll be sure to use that exact brand next time I brew the recipe. The beer has a rich and creamy mouthfeel, but the body was still light and refreshing. The carbonation dried out the finish nicely as the beer cried out for me to take another sip. At least I think that's what I heard so I'll go with it. The wheat was at the fore in-terms of flavor. The malt was sufficiently balanced with sweet orange notes, spice from the coriander, and the dry finish. I did get some residual sweetness from the honey and some delicate esters. It all blended perfectly. I was in love with this beer at first sip. After a few the beer started to remind me a bit of something I couldn't put my finger on, then it hit me,I thought made a Shock Top clone! It wasn't until I had my beer and a Shock Top Belgian White recently that I was reassured my beer was superior. Shock top and Blue Moon use a sweet orange peel not unlike the navel orange I used, as opposed to the more traditional bitter orange peel. I think that may be where the similarity came from. This was one of the best beers I have brewed in a long time. The only change I may make for next time is swapping out the fresh orange zest for a more bitter orange peel you can buy at a homebrew shop. I probably won't, but it's a thought. If I didn't already have so many other beers in my pipeline I would brew this one again soon. Like most brewers I almost always brew on the weekend when there is plenty of time during the day to brew and enjoy a beer. This past weekend I judged at a competition in Boston, visited Trillium, and bottled my Blueberry Wheat Ale. That didn't leave a lot of time for brewing. The only thing I have brewed since I returned from vacation was the Cabot Street Hop Harvest. There was another beer I wanted to brew in April I haven't brewed yet. I had planned on brewing three batches in May to be ready for the summer, and I need to brew another batch of Curly's Milk Stout. That is a backlog of five beers These are all batches I already bought ingredients for. I need to get in gear! Hefeweizen, a type of German weizen/weissbier, is one of my girlfriend's favorite styles. I love them as well. Whenever I am at The Indo and can't decide what to order, I will fall back to Weihenstephaner Hefeweissbier which they always have on draught, and serve in a beautiful glass. The style is light and spritzy, perfect for the summer. The malt is at least 50% wheat, there is no hop flavor, the hops only provide a small amount of bitterness, and most of the flavor comes from the esters and phenols produced by traditional weizen yeasts. The esters frequently have notes of banana and bubble gum, while the phenols provide notes of cloves which balances the malt sweetness and helps dry the finish. American hefeweizens like Widmer Brothers Hefeweizen and Harpoon UFO Hefeweizen use American yeasts with a much cleaner flavor profile. Stylistically they belong in the American Wheat category. I have brewed two hefes in the past. The first was an extract version that came out quite dark because Wheat Liquid Malt Extract is dark in and of itself. My second attempt was a partial-mash which was lighter. The problem with both beers is that I ended up with gushers and bottle bombs. The cause was likely adding too much priming sugar at bottling. Reviewing my notes, the first batch may not have been done fermenting when I bottled it after only seven days. Some of the online priming sugar calculators suggest that the beer should have 3.6 vol of CO2. In my experience even if you use a strong enough of a bottle to hold that much pressure, the beer will be so over-carbonated that the best case scenario is that you end up pouring foam and waiting for it to settle. I attempted to make sure the second time around the carbonation was not as high as our first batch. I was able to enjoy a few before they became geysers. When I revisited the recipe I saw I had two types of hops and three hop additions for a beer with essentially no hop flavor. I don't remember exactly what I was thinking so I decided to go back to the drawing board. My first reference was Brewing Classic Styles. The book has tips for every style of beer and award winning recipes. This seemed like a good time to brew one of the recipes from the book. I took co-author Jamil Zainasheff's "Harold is Weizen" recipe and tweaked it to fit my system. Instead of using German hops I used leftover Mt. Hood hops, which while American, has a German lineage and flavor. When I didn't have quite enough Mt. Hood to provide sufficient bitterness, I supplemented them with some Glacier. For a beer without a lot of hop flavor it should be fine. I used German Pale Wheat Malt, German Pilsner malt, and wheat extract for the grist. I added half a tsp of gypsum to make sure there was enough calcium in the water. Out of laziness I didn't make a yeast starter, but for a beer of this strength I think it will be fine with just the smack pack. I do remember my previous hefeweizens being more phenolic than estery, Jamil suggests the beer ferment at a cool 62F. With a swamp cooler setup like I used when I brewed The Sustenence I should be able to ferment in that range. With the warm weather already here I'll probably have to use it for all of my batches until I brew some Belgian styles during the summer. I brewed this on a Wednesday night to make sure the beer is ready for the Northshore Brewers June meeting. I rejoined the club back in January where we went on a tour of Cape Ann Brewing. We have since missed the February and March meetings. The June meeting is a style meeting for German wheat beers, where members discuss the style while sampling homebrewed and commercial examples. As I wanted to brew this beer beforehand, this worked out perfectly. What I will do is fill one of my Party Pig mini-kegs to bring to the meeting and bottle the rest. I didn't start brewing until 7:00 p.m. and finished up around midnight. I think if I brew on a weeknight again I'll start earlier, make sure the boil is only 60 instead of 90 minutes, or stick to extract. The WAR IPA was something of an afterthought. I was anxious to re-brew Walk-off White. WAR IPA was intended to use the yeast I bought to brew the witbier, and also experiment brewing my own IPA. The hop selection was somewhat haphazard based on my desire to use up leftover hops from other recipes. The beer pours a hazy gold color. It is darker than Walk-Off White likely due in part to the additional malt used to boost the final gravity and alcohol content of the beer. I also consciously chose to use slightly darker malted wheat as opposed to having all of the wheat be flaked so I could contrast the two. The color was still exactly what I was going for. The beer has a thick, frothy white head with good retention. The hop aroma is muted, but overall but quite complex. The hop aroma doesn't hit you like a bus, but there are citrus notes there. Being a White IPA fermented with Belgian yeast, the expected hay and straw aromas are present as well. When crafting the recipe I hemmed and hawed whether or not to add citrus and spice like a traditional Belgian Witbier, or let the American hops contribute most of the flavor. The beer finished with more than enough citrus flavor, likely from the Citra and Centennial hops. The mouthfeel wasn't as creamy as Walk-off White, but the wheat flavor was noticeable. I didn't get the kind of silkiness from the flaked oats like I would expect from an Oatmeal Stout. The carbonation is high like a witbier which may have cut into any character from the oats. The body was medium, maybe a touch too heavy, but not a major flaw. The hops and carbonation give the beer a dry finish. I found this beer brewed with 3944 Belgian Witbier yeast was more phenolic, than the Walk-off White brewed with 3942 Belgian Wheat yeast. I am enjoying the beer, but not as much as the Walk-off White. The mouthfeel and head retention were higher using the unmalted flaked wheat as opposed to the malted wheat. The lighter body in the Walk-off made it more refreshing. The 3944 Belgian Wheat gave it a more delicate flavor. I ended up with two very drinkable beers. By using different ingredients in two similar, but different beers, I know which ones I prefer for the future and firsthand the differences they will provide. Tiny Trillium Brewing, located on Congress Street in Boston's Fort Point neighborhood has emerged as one of the region's most highly regarded craft brewers. When Trillium was forced to close due to a licensing SNAFU late last year it created a minor uproar in the local craft beer community. Thankfully Trillium has been able to not only reopen, they also have a new production brewery in the works. Trillium sells the vast majority of their beer at the brewery in 22oz bombers and growler fills. The only retailer north of Boston to carry their products is Redstone Liquors in Stoneham. Until last weekend I hadn't made the time to drive into town, attempt to find parking, and visit the brewery. I was already in town to judge in the Boston Homebrew Competition making it as good a time as any to stop in. I did previously have a few Trillium beers in the past. I bought the Trillium ale, a saison, and Pot & Kettle, an oatmeal stout at Redstone. Those were both very good beers, but it's Trillium's hop-forward pale ales and IPAs for which they are most known. I gave Fort Point Pale Ale, Galaxy Dry Hopped Fort Point Pale Ale, and Melcher Street IPA all 4.5 ratings on Untappd. Since I'm not exactly in that neck of the woods everyday I decided to almost buy one of everything. Treecreeper was a 5.5% ABV hoppy American Wheat ale available in growlers only. The hop flavor and aroma hits you like a truck, but there is enough creamy wheat flavor to balance while not clashing with the hops. Double Dry Hopped Melcher Street was available in bottle and for growler fills. I went with a growler of that as well. In addition to the two growlers and fills, I picked up three other bottles. With tip I spent over $90. Operating in Boston as opposed to a sketchy industrial park in Everett carries additional costs. Trillium is too small to scale like a larger brewer. Using as much hops as they do also drives up their ingredient costs. Their beer isn't cheap even compared to other craft beers, but like most things it is expensive because it is worth it. The guy who helped me behind the bar asked it it was my first time there and if I needed new growlers. When I said it was and I did he told me that these were my growlers and gave me detailed instructions of how to clean them. I probably could have just told him I was a homebrewer and knew what I was doing. The impression I got was that when I go back they will refill my growlers which I am responsible to clean beforehand, instead of them just swapping them out for fresh ones, or returning them and getting my deposit back. I suppose it's one way to avoid washing growlers when running a small and very busy brewery. On our recent road trip most of the IPAs I had were balanced, "East Coast"-style IPAs. I found myself craving the type of hop forward, "West Coast" beers Trillium, Stoneface, and Bissell Brothers brew so well. As happy as I have been with my recent IPAs, I wish I could brew something that packs that kind of hop punch. After fermentation oxygen is your beer's mortal enemy, especially when making a hop-forward beer. The volitale hop oils that provide that in-your-face aroma you and flavor will escape given the chance. The Alchemist's stated rationale for instructing people to drink Heady Topper out of the can is to contain the aromatics. I overheard one brewer who I was judging with describe the lengths he goes to when brewing IPAs. He never racks to a secondary fermentation vessel; he purges his kegs, siphons and tubing with CO2. Another brewer I was speaking with said he planned to dry hop in a keg, hit it with some CO2 to insure there is no oxygen, and when the beer has been on the dry hops for long enough he wants to use the gas to push the beer into another keg ensuring no oxygen touches the beer after the dry hops are added. My system at this time is just not conducive to eliminating oxygen to that degree. As soon as I rack the beer to a bottling bucket it is exposed. Then the beer sits in an open bucket while the bottles are filled. The two to three week bottle conditioning period cuts into an IPA's flavor peak. Hop flavor and aroma are the first things to go in a beer as it ages. Maine Beer Company tells you right on the bottle to drink the beer young. A crimp capped bottle is not impervious to oxygen like a keg, or canned commercial beer. Until I have a fully operational kegging system at home, I won't be able to replicate the barrage of hop flavor and aroma that Trillium achieves in their beer. I can and will make very good IPAs, but there is a glass ceiling that probably prevents me from brewing an elite West Coast hop bomb of an IPA. These equipment limitations are less of an issue with other styles. Finding parking late Saturday afternoon near Trillium on Boston Wharf Rd wasn't that bad at all. I may have to stop in with my growlers before my next Sunday brew day. Now that my cousin/brewing collaborator Andy is settled into his new home, and said home no longer has a backyard filled with snow, we were finally able to go out and brew some all-grain batches outside. As a housewarming gift I bought a sparge arm to help better control the flow of the hot sparge water over the grain bed. Pa's Videoboard Lager finished much lighter than we had hoped, and I think where we went wrong was that we sparged too fast and did not rinse as much fermentable sugar off the grain as we had planned. On what was a double brew day we brewed Andy and his brother-in-law Greg's Cabot Street RYE-PA. When Andy and Greg brewed together Greg was more of the creative force that developed their recipes. Now Greg has three boys under the age of six, so leaving home for an all-day brew day is understandably difficult. If you are looking for consistency from batch-to-batch, or are looking to improve from batch-to-batch, note taking is essential. You need to know what you did before so you avoid repeating mistakes, or conversely know how to replicate what you have done in the past that did work. Greg and Andy have taken a casual approach to this over the years. As we were about to start the boil for the RYE-PA, Andy realized he didn't have the recipe and was not sure what the hop schedule was. He asked me what I thought it was. My best guess was 1 oz of Columbus at 60 minutes, and the late hop additions was pure guesswork. Luckily Andy found the hop schedule scribbled in the margins of a past ingredient purchase order. For my own peace of mind I put the recipe in my BeerSmith account and sent Andy the link. I also slipped in some gypsum knowing how poor our local water is for hoppy beer. The second beer we brewed was originally supposed to be brewed at my house. Andy wanted me to show him and his wife Juli how we brew at home on our stove top. We never got around to doing that over the winter, even though I bought the ingredients months ago. Between holidays, Andy buying his new house, selling the old house, moving, stuff we had going on, we just never got around to it. At his old house Andy had home grown hops. Growing hops at home deserves its own post in the future so I won't go too in-depth here. Knowing that he would be selling his house, Andy froze the hops he harvested last fall and asked me to come up with a recipe that would work with his hops. I asked him and Greg what hop variety they were, but they were not sure having originally planted the bines several years ago. Greg's best guess is that they were Cascade or Centennial. Over the years the plants could have easily cross-pollinated so who knows what they are now anyway. For the Cabot Street Hop Harvest IPA I wanted to create a recipe that featured and accentuated the one-of-a-kind Cabot St. hop blend. Unless hops are analyzed by a lab it is impossible to know what the Alpha Acid levels in the cones are, which determines how much bitterness they will add to the beer. For that reason it is best to use home-grown hops for flavoring and aroma, while using store-bought hops for bittering early in the boil. For this recipe I chose Warrior hops because they are high in Alpha Acids and provide a very clean bitterness without contributing much flavor. The grist was just 2-row barley, some flaked barley for added body and head retention, and some corn sugar to boost the alcohol level without adding too much body. Safale S05 yeast will finish nice and clean with good attenuation making sure the beer doesn't finish too malty. Every ingredient in this beer is intended not to clash with the home-grown hops. In a perfect world the hops would have been dried, and vacuum sealed in a non-plastic container impervious to light because light and oxygen are what cause hops to degrade. Luckily the hops seemed to have kept well in Andy's freezer in a ziplock bag. Andy did replant the hops at his new home. Even if they do take, it will likely take another year before we have enough of a yield to do another batch again. I am anxious to see how this one-of-a-kind beer comes out!